There is an abundance of outfitters in Africa. It can be scary trying to decide which outfitter is right for you. Let JWD help you create the adventure of a lifetime. Whether it is an extensive hunting Safari or a world-class photographic safari we can help you. JWD has been to Africa and seen everything first hand. Joining us in South Africa is a very personal experience. Everything is taken into consideration and we will do anything we can to make sure you have the adventure of a lifetime. The hunting is top notch, with a lot of game in all areas – your guide will take the time to find mature animals to be harvested. The game is abundant, and you will see all kinds of different animals every day during your adventure. There are many different regions in South Africa holding different animals to pursue, and our outfitter has access to multiple concessions, many of which are free-range low fence areas creating great hunting opportunity. You will always be accompanied with a Head PH, who is family member or owner of the outfit, in addition to a tracker skinner, and often times a second PH. Our PH’s are excellent at spotting game and looking for the right old mature animals to pursue and harvest. Hunting is their passion, so they are very fun to hunt with, creating more than a hunting trip but an experience of a lifetime. Hunting can range from plains game, specific specialty game, Big Five and Dangerous Seven game. The sky is the limit for your safari and it is built to your specifications and desires with Jonas Brothers Wild Devotion. South Africa holds some of the best Wing Shooting possibilities in the world but is extremely underrated. The upland hunting is great on the edges of agriculture fields and vast grass fields. You will hunt over well training German Short Hair Pointers who hunt in range and are steady on the point. These birds fly hard and can be found in singles or as big as groups of twenty plus birds. SA doesn’t only have great upland but waterfowl as well; holding claim to the largest and smallest goose in the world with everything in-between, there is a myriad of species available to pursue. 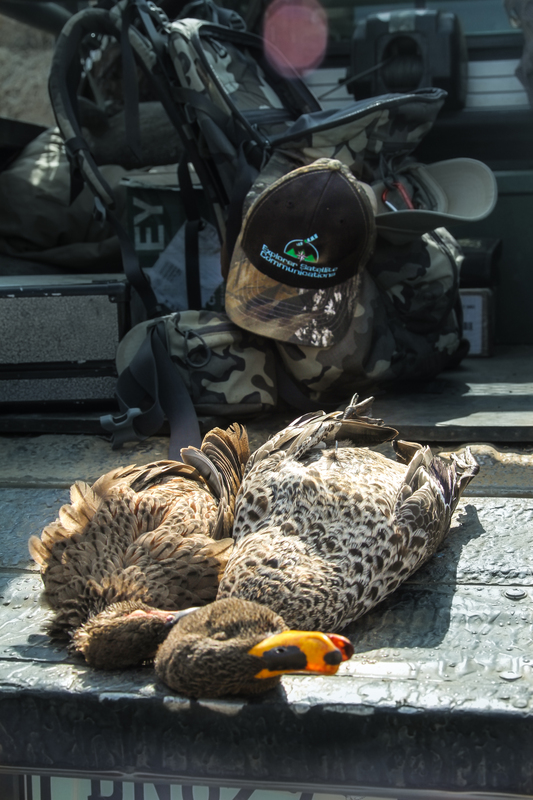 Hunting over dams and agriculture fields with small decoys spreads, the shooting can be unmatched. It is truly an amazing experience wing shooting in Africa and once you do it, it will call you back again and again.